"In a stunning turnaround, President Obama has lost roughly half of his support among Jewish voters. A poll by McLaughlin and Associates found that, while 78 percent of Jewish voters cast their ballots for Obama, only 42 percent of Jewish voters would vote to re-elect him. A plurality — 46 percent — would consider voting for anyone else. That compares with 21 percent who voted for John McCain. 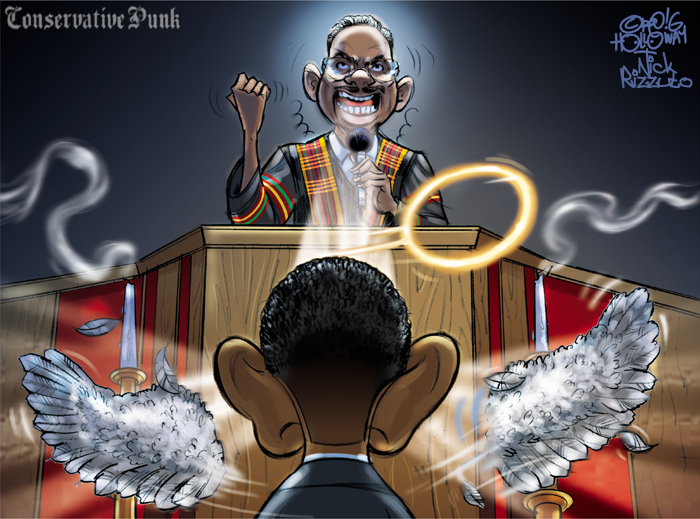 Ever since he learned of Obama’s ties to the Rev. Jeremiah Wright, Morton Klein, president of the Zionist Organization of America, has been warning fellow Jews that Obama would be antithetical to Jewish interests, not only as they relate to Israel but also to issues that affect all Americans. Before Obama was elected, Klein, whose organization of 30,000 members is the oldest pro-Israel group in the country, felt like a pariah. Now, as he speaks to Jewish audiences on a weekly basis, he has found that the climate has changed dramatically. “As I speak at synagogues now around the country, I haven’t had a single person during Q and A or after my talk ask how I could be so critical of Obama,” Klein tells Newsmax. Klein tells his audiences they should not be surprised that Obama’s left-leaning policies appear to tilt more toward the Palestinians than to Israelis. He cites the fact that Obama and his wife, Michelle, spent 20 years listening to Wright, who routinely denounced Israel as a racist state and America for allegedly having created the AIDS virus to kill off blacks." Israeli satirist troupe, LatmaTV, creates a musical look into what drives Obama's priority to create a hostile Palestinian state adjacent to Israel. Your backing of a man who has spent his life surrounding himself with the worst anti-Semites America has to offer -- Jeremiah Wright, Rashid Khalidi (former Palestinian terrorist spokesman), Louis Farrakhan ("I don't like the way [Jews] leech on us"), Samantha Power, Robert Malley, to name a few -- is nothing short of reprehensible. Rahm Emanuel's presence in the Obama cabinet doesn't ameliorate Obama's anti-Semitism -- it just provides it convenient cover. Al Sharpton wrongly called Condoleezza Rice and Colin Powell "house negroes"; Emanuel is a kapo. Read it all.